I have been getting to grips with rotary encoders on the Arduino, and to add a little drama I have gotten this working on the i2c bus. Here I will be showing how to set up the necessary hardware and demonstrate a program for the Arduino. 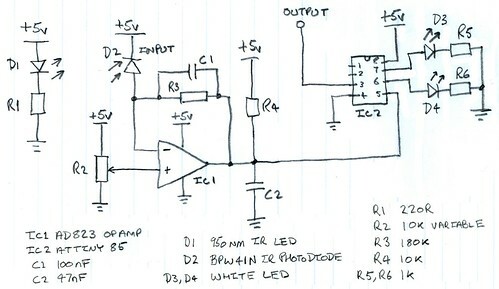 I have used a similar setup to control an LED RGB light strip, with three rotary encoders to control the Red, Green and Blue and a fourth for special effects. The i2c bus allows connection of multiple devices to the Arduino on just two wires, these can be just about anything from temperature sensors to motor controllers with each device having its own address, up to eight of these can be used using just two wires from the Arduino. The address for the expander is set on pins 15, 16 and 17 (A0, A1 and A2), for a single encoder set all of these to ground. 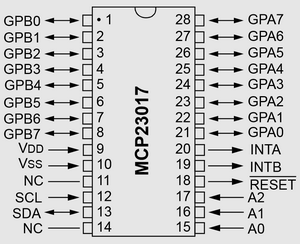 Should you require more expanders the addresses can be set as in the table below, the MCP address is for the Arduino program. 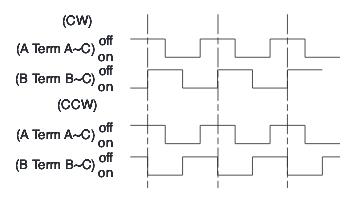 Inside they have mechanical contacts that output two square waves when rotated, A and B these are 90o out of phase with each other so when rotated clockwise output A is ahead of B, and counter-clockwise output B takes the lead, this is a two bit Grey code. So by comparing the two outputs we can determine the direction of rotation. My test setup comprises of two rotary encoders, one Arduino Uno, one MCP23017 port expander, and a couple of resistors. External pull-up resistors are not required on the GPx input ports as the MCP23017 has these internally. Encoder A uses GPA0, GPA1 and GPA2 for the push button. Encoder B is on GPA4, GPA5, and GPA6. My program uses the Adafruit MCP23017 and standard wire libraries. The Adafriut library addresses the GPx ports from 0-15, so GPA2 is 2, and GPB2 is 9. I have written this to output the state of rotation to the serial port at 9600 baud. // setup the encoders as inputs. // do something when a particular encoder has been rotated. // set the selection to 101 now we have finished doing things. Not 0 as there is an encoder 0. 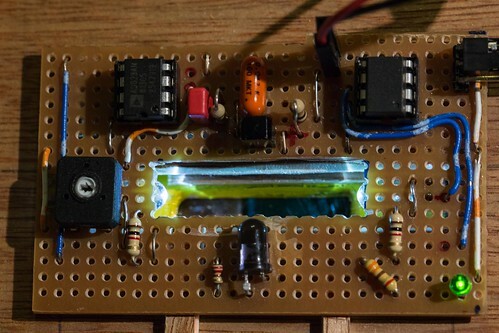 For something I’m building I need have the Arduino detect a coin being dropped trough a slot, for this I have built an IR detector, it comprises of an IR LED, IR Photo-Diode, Op-amp and ATtiny85 micro-controller. The circuit works by having the IR LED flood the Photo-diode so that when an object passes between them the Photo-diode stops letting current through, this is fed into the op-amp to provide a consistent output for the ATtiny85 micro-controller to detect the change in signal to then flash a couple of LED’s and provide a signal to an Arduino. * flash and makes pin3 go high for 120ms.